This one is definitely one of my favorites!! 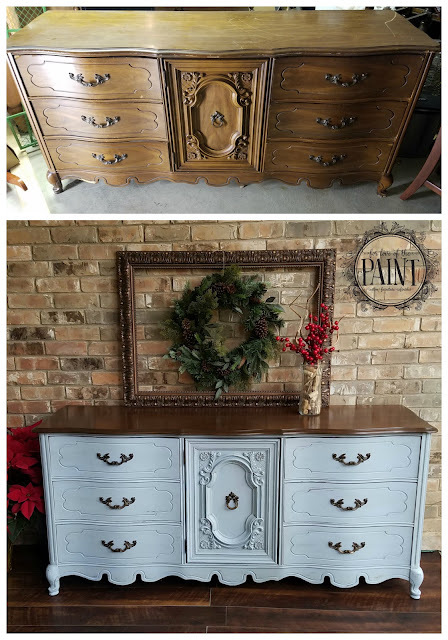 When I first tried Annie Sloan's Louis Blue Chalk Paint, I had a hard time waxing it without leaving a smudgy appearance, and eventually solved that by mixing some of the paint into the wax to create a tinted wax. For this piece, I sealed with General Finishes High Performance Top Coat, and it was a breeze! We sanded the top of this one all the way back to the raw wood, stained the top with General Finishes Antique Walnut gel stain, and painted the body Louis Blue. A little light distressing and this one was an absolute showstopper!! I may be a little biased because I adore color, but I totally think blue is a neutral. Look how it even goes with this deep, bright red! *Swoon* . What is your favorite unexpected color combination? I'd love to give it a try!